The time: Summer 1991. The place: Gatlinburg, Tennessee. The age: Six years old. I do none of this to make anyone feel old reading this, simply to establish the time and circumstances I first met 007. My grandfather had been diagnosed with lung cancer sometime earlier – he didn’t smoke – but it was lung cancer. There are flashes in my mind of us, my mother, father, and I, driving to Ohio for his treatments. The treatments had happened earlier, but again, I can’t quite place when. This is what led us to Gatlinburg. Gatlinburg is a popular resort town in East Tennessee, only a short drive away from the Disneyland of Tennessee, Dollywood. My grandfather’s cancer was in remission, and it was decided that a fantastic vacation would be had. An entire week, in rented condos. My family with our own condo, and my grandparents in one of their own as well. A stairwell connected the two, and I remember walking between the two listening to my jam of the summer, Amy Grant’s “Baby Baby” on a portable cassette player. The condos were nice. Each had a kitchenette and hot tubs. I’d never seen a hot tub before, and surrounded by the beautiful Great Smoky Mountains nearby, this was the epitome of luxury to a six year old. I can’t recall the exact particulars, it must have been after dinner. It was still light outside. My grandfather was sitting on the edge of the bed, watching something on TV. I went and sat beside him. I had no clue what he was watching. But as I sat there watching the TV with him, one thing became clear to me. I had never seen anything like this before. Why is this guy running around with a gun, in a tuxedo? At six, I knew I had two things figured out about myself. One was that I really liked music, the other was that I really liked movies. Yet I had never seen a movie quite like this. “What is this?” I asked him. “This is a James Bond movie,” my grandfather replied. “He’s a secret agent from England.” OK. James Bond, neat name. Secret Agent? From England? What kind of agent? “Is he a good guy?” I asked. “Yes, Andy. He’s a good guy. He saves the world and gets the girl,” was the response from my grandfather, who I called “Da” by the way. So there we were, two guys watching James Bond together. One a seasoned pro and the other just barely wrapping his head around the excitement. I’m sure there are those who say that perhaps James Bond isn’t the most appropriate viewing for someone that age. But no one said anything about it, or made a fuss over it. It was just a grandson and his grandfather watching A View to A Kill on ABC. The title I only knew because I remember the sounds of the announcer saying, “We’ll return to A View to A Kill in a moment” during the commercial breaks. The following year my grandfather passed away. The cancer had returned. It was 1992, and I was seven years old. As a result, I have very few memories of my mother’s father. Moments flash in my mind, quick snippets of mundane moments. However, the clearest memory, and the one that is marked so indelibly in my brain, is that of watching A View to a Kill. It also stands as the only memory I have of him and I actually doing something together. There were simple runs to the grocery, but in terms of actually engaging in the same act together, that’s it. A View to a Kill. Flash forward to 1996. That seven year old is now eleven, and in the exciting new world of cable television, James Bond movies are a staple in the TBS line-up. This is where my memory gets a little hazy. I can’t recall what film I saw that made it click in my head that it was the same character of that movie my grandfather and I had watched together. I can’t even recall when I began regularly watching the James Bond movies. I just know it happened around the mid-1990s. Pre-teen Andy was a big fan of secret agent 007. Weekends were filled with VHS fueled marathons of the Bond Films. They became games “Can I fit all the Sean Connery films in on a single day?” By the time puberty hit, I owned every single Bond film on VHS tape, all arranged in chronological order on a shelf in my bedroom. Beside them lied a stack of James Bond trading cards and a book on James Bond poster art. Puberty hits, things start to change. To paint a picture: one afternoon you’re watching Ursula Andress walk out of the water in Dr. No and you start to realize that you really like women in a way you didn’t know was possible before. If there was one thing I picked up about the way Bond treated his women, it’s that he always got the best for them. We could argue all day about the sexism and misogyny in James Bond. But that was never why I liked James Bond, it never entered into the equation. I always struggle some whenever someone asks me “What’s your favorite _______ ?” I love so many movies, albums, songs, TV series, that it’s downright difficult to pick just one to signify my choice as my all time favorite. Yet when the question is asked “What’s your favorite James Bond movie?” After a pause to think, my mind always comes back to Thunderball. Do I consider Thunderball to be the best James Bond movie ever made? No, I don’t. Yet my mind always goes straight to it. Part of my affinity for Thunderball comes from it having so many of my favorite Bond elements. There’s the icon of icons, the Aston Martin DB5, for one example. Bond convalescing/staying in some ridiculously opulent hotel/resort. It also has one element that I secretly love to root for. In some Bond films, there’s the one really annoying henchman. He pesters Bond and annoys you to the point that you look forward to seeing his demise. For me, the balding dude in Thunderball fits the bill. Which makes his death later in the film, with the perfect Bond delivery of “I think he got the point,” all more delicious. Once we get past the marvelous opening by Maurice Binder, we’re treated to a scene quickly introducing us to the villain, Largo, and showing the SPECTRE organization having a board meeting of sorts. It’s one of the Bond moments that directly influenced Mike Myers and the production crew of Austin Powers. Largo has all the trademarks of a Bond villain, sharp dresser, plush lifestyle, and the ever-present eyepatch facial distinction. Not to mention a swimming pool full of sharks. Not quite the everyday item one can pick up at The Home Depot. I’m no action-movie expert, but Thunderball has to be one of the few to set most of its major set-pieces entirely underwater. A bunch of guys in wetsuits attacking each other doesn’t sound like fun, but it is. It’s delightfully fun. 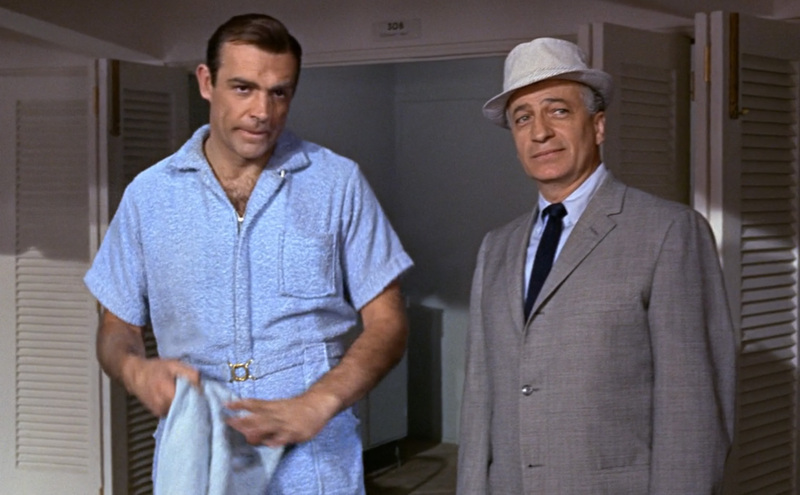 Naturally, Bond is outfitted by Q with a number of lovely gadgets. While Q himself is outfitted in island gear that is a touch most perfect. A fantastic fight sequence begins, the John Barry score booms, and furniture gets beat to hell. Bond kills Jack Bouvier, tosses some flowers onto the corpse. Even if it’d stopped there, it’d be pretty fantastic. But it continues. Bond straps on a jet back, hops in the DB5 and drives away as Tom Jones steps up to croon. What more could one ask for out of a James Bond pre-title sequence? Connery is fully perfect as Bond here, which might be due it being the last Bond film before he unofficially checked out. For me, Thunderball has everything I want out of a James Bond movie. Big, brassy John Barry score, a wide, beautifully filed screen image. Connery at his peak, the DB5, lovely ladies, a villain with an eye patch, and a jet pack! Bond films have a history of being a little on the ridiculous side. Something that Thunderball manages to work with perfectly. It’s realistic, but it’s still well within the fantasy world of Bond. I’ve always been impressed by how Thunderball managed to maintain a grand scope throughout the entire film. 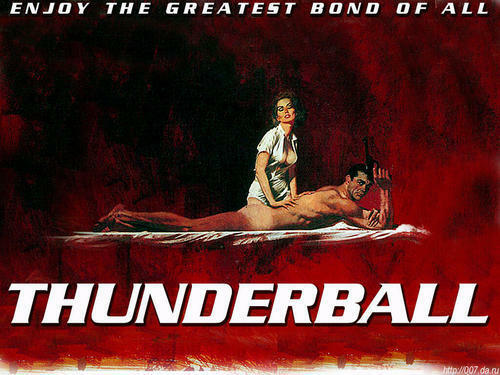 Even in the 90s – watching the movie on a pan and scanned VHS tape that eliminated a good 45% of the picture – Thunderball still managed to feel “epic.” When the newer home video formats came along, Thunderball was always one of the first titles I’d pick up. It was the first Blu-ray I bought, and the Bond films in general were among the very first DVDs I ever owned. I like Thunderball, and I always have. Sometimes when we find things that we love, we can’t quite say what makes them our favorite. But I’ve always, ever since I was a kid, held it up as my go-to when someone asks me “What’s your favorite James Bond movie?” It just gives me everything I want. And it gives the franchise an anchor, a model that the franchise could always return to for inspiration. Andy Ross is a writer and humorist from and living in Northeast Tennessee. He’s written plays, hosted a radio show, and freelanced for record labels writing liner notes. For the past seven years he’s been a featured columnist at The Loafer, a weekly entertainment magazine in the Tri-Cities, TN area (www.theloaferonline.com). His work can been seen on his blog heythereandy.blogspot.com. Favorite Bond Actor: Even though my head tells me Sean Connery, I have a soft spot for Roger Moore. How I Discovered #Bond_age_: referred by @krissy_myers, who I’ve known for years. First joined a live tweet during A View to a Kill.